It was E3 in New York last night as Nintendo re-booked the highest floor we've ever played games in, to showcase a fall line-up headlined by New Super Mario Bros. Wii. Some observations from a four-player session. Crecente has already previewed Nintendo's holiday-slated return of side-scrolling Mario to the Wii. He played it at E3 where he discovered its "competitive cooperative" design. I played that same E3 build last night, high above my old work neighborhood in Times Square. I played as the blue Toad three Nintendo reps controlled Mario, Luigi and the Yellow Toad. You hold the Wii remote sideways and control things like you're back playing the Nintendo Entertainment System. Over the course of three levels, I got a healthy helping of competitive cooperative. I had victorious moments and failures, all involving the game's goal to reach the end of a level with the most points. Victoriously, I put my Toad in a propeller suit and had him flutter to the top of the screen to grab coins my fellow players failed to reach. Furiously, I watched my Toad get hoisted above the head of another player's character and ferried right into a piranha plant poking its toothy blossom out of an upside-down pipe. New Super Mario Bros. Wii is similar to the GameCube's Legend of Zelda: Four Swords Adventures in that it seems to reverse technological innovation in its franchise in order to present a multiplayer game with simpler level design and more complex player-driven interaction. Most previous Mario games have been player vs. Nintendo-level-designer. This one's essentially player-vs.-player with the level as, well, a stage. As in one where drama occurs. Another victorious moment (for someone else): They got all the penguin suits and sledded away while I fell down an icy crevasse. Another victorious moment (for me): I discovered that New Super Mario Bros. Wii has a wall-jump that makes the beginning of a plummet down a bottomless pit a recoverable drop. I bounced Toad up and out of that crevasse. There are risks with allowing the chaos of sometimes-cooperative friends to try to traverse a Mario level together. Not all of them are due to human nature. Some are design decisions that aren't yet convincing. Character death, for example, makes the game hiccup a pause. That effectively signals that someone has bought it. But it also disrupts the momentum and timing of he or she who is bounding through the same level. There's an inspired invisible countdown that requires all players reach the end-of-level flag within a few seconds of the first one reaching it. There's a more questionable design element that warps players all in or out of a green transit pipe within a few seconds of the first player going through it. So imagine we're playing and you go through the pipe to get us to the coin-filled underground. We both go there. And you run toward the coins. But I just back out through the pipe. The result: we warp back out. You get no coins. That spells trouble. Crecente praised "little things" in his preview. I saw a good one: in an underground level that set us on a floating raft, a searchlight illuminated portions of the cave. The first character to stand on the raft would gain, through tilts of their Wii remote, the ability to tilt the spotlight. If that character left the raft, the spotlight would change color to indicate which other player was now in control of it. A victorious moment: Jumping off Mario's head to avoid falling in a pit. A not-so-victorious moment: All of us except the Nintendo rep controlling Mario running out of lives, forcing us to watch him trot to the flagpole and tally enough points to beat us. The E3 build of New Super Mario Bros. has no map or hub world or whatever it is that Nintendo's designers intend to use to unify the side-scrolling levels in the game. It also doesn't have the computer-assisted play-through option Crecente uncovered from Mario creator Shigeru Miyamoto at the big show. 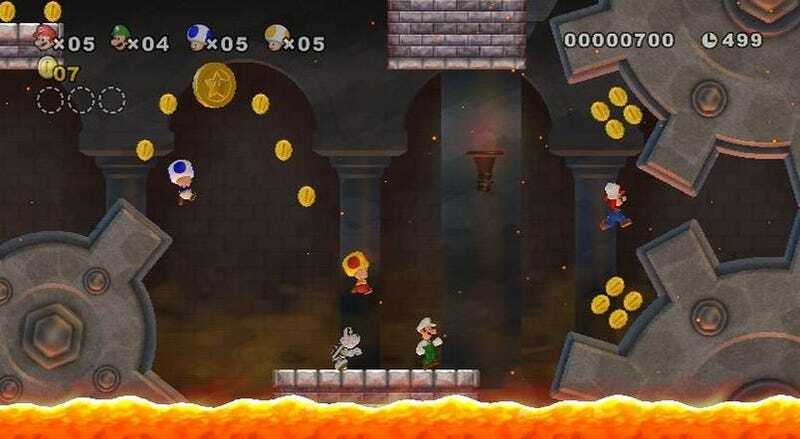 Super Mario Bros. Wii may have a surprise in store for gamers when it hits later this year. I don't think I played much of the game that was different than what Crecente experienced at E3. But the strength of a good multiplayer game is how re-treading the same levels with new players at a new time can feel distinct from a similar session weeks, days or minutes ago. What I played felt good with caveats, with maybe not as much level design depth as we saw in Super Mario Galaxy but a chance to make the players of a Mario game the main event like we've never experienced before.